When the 2014 Formula 1 Season started in march there were big changes to what we were used to see before. For the first time in a very long time Sebastian Vettel wasn’t the winner and he still hasn’t managed to be on top of the podium with less than half the season remaining. The sound of the new engines was widely criticized by fans which now creates part of its power by a Energy Recovery System. On the bright side we have seen a tougher competition among the whole field with the exception of the Mercedes Benz drivers who have won all but three races of the season so far. Ferrari has not been the same team ever since Michael Schumacher left the team. They have not lived up to its name and Stefano Domenicali resigned from his position as team principal of the Ferrari Formula One team on mid-august. Marco Mattiacci, former president and CEO of Ferrari North America replaced him. Fernando Alonso has done more for the team than what his car has to offer. The two-time world champion has repeatedly performed at a world-class level but will not be with the “Cavallino Rampante” starting next season. Four-time F1 World Champion Sebastian Vettel is about to make his move to Ferrari official any minute. Alonso could be going back to McLaren. I’ve been following Formula 1 for a bit now and I can assure you that this one has been the most exciting one. Besides Lewis Hamilton, Nico Rosberg and Daniel Ricciardo being the only three pilots who have won races this far, the battle for second to 23rd place is always up for anyone. Mexican driver Sergio Perez is having his best season. He finished third in Bahrein and has been able to rack up some points in nine races currently sitting on the tenth spot overall. Esteban Gutierrez had a strong finish in the 2013 season, but the changes to his car have not been positive and so far he has no points, either has his teammate Adrian Sutil. Hamilton leads the board just ten points over Rosberg. Just to show how tough these drivers are, they have endured extreme temperatures in places like Singapore and a close typhoon in Japan. At the first one Danii Kyvat and Kevin Magnussen reported burns and dehydration during the night race. That was nothing compared to what happened in Japan. The race started under a yellow flag due to the heavy rain. After a short pause it resumed and it was impressive to see how short of a visibility range drivers had along the course while still driving over 200 km/h. 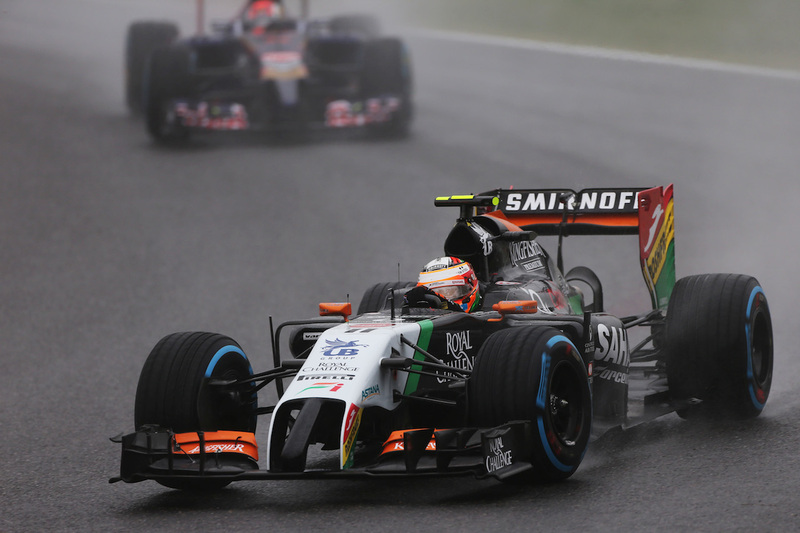 The race was about to end when Adrian Sutil lost control of his car on turn 12 and crashed with a safety wall. There was a provisional yellow flag issued (which should have resulted in the safety car immediately). One lap later Jules Bianchi lost control of his Marussia in the same exact spot. The result was him crashing against the crane that was lifting Sutil’s car at around 160 miles per hour. it took a while for the press to know what was going on since there was no video of the incident. What should have been a week of celebration in the wake of the first Russian Grand Prix ever, has been a week where Bianchi is fighting for his life in Japan and all the attention is on increasing an already tight security around Formula 1 plus really knowing what happened in what is surely Bianchi’s last lap ever as a F1 driver. Some experts say that race should have not even happened under the conditions it was raced in. But now Russia is set to host a Grand Prix. Next year Mexico will have the return of the highest category in automotive racing come to a city where many stories were written. Austin is setting itself as one of the driver’s favorite places to race at with just two years in existence, the rumor is New York could be next and it could actually be a street-circuit and not on an actual track. You can already tell safety will be made an even higher priority from now on at old and new circuits. Safety measures are bound to change, but what spectators around the world hope that does not change is the excitement of the current F1 season. Many of us were tired of the dictatorship that drivers like Vettel and Schumacher had at every race. If Bernie Ecclestone wants more fans to tune into F1 activities, a season as exciting as this one should be a common situation. Viewer Discretion is advised to watch this link containing the crash of Jules Bianchi.